May climbing be bad for my fingers? I boulder (climbing at jump altitude), which needs a lot of finger strength, once or twice a week. Sometimes my fingers seem a bit static and less fluid several hours afterwards. Does anyone know, if climbing might affect my fingers on the long term? Re: May climbing be bad for my fingers? It seems that you would not be doing your technique any favors, and certainly your nails would suffer. On the other hand, if you're not a pro, perhaps it shouldn't matter. You might want to develop a good warm-up routine with stretches after climbing before you practice or play. I'm certainly not a pro when it comes to CG, but I'm working towards it in regards of jazz guitar. 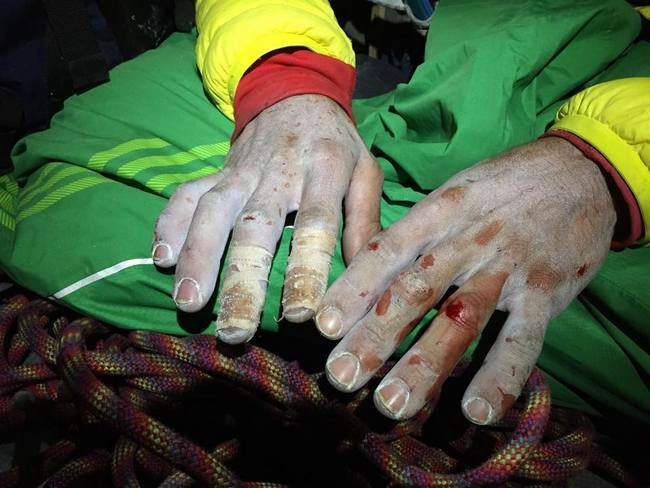 I think climbing would be great for your fingers, not so great for your nails. Also i seem to get more fluid on the CG, i suppose the non-fluidness is more related, to not playing classical for years than to climbing, but i'll keep watching it briefly! I used to do this also, although I was never a very good climber. I quit because it made playing difficult and tore up my nails. I felt somehow sluggish after a lot of climbing. My fingers had that slow, "running in a nightmare where you can't run" kind of feeling. For me it was one or the other. I was trying to imagine a worse sport than climbing for a classical guitarist, then i remembered that Julian Bream was a keen cricketer ! I don't have any problems playing CG after climbing, it may even be a usefull stretching unit for the fingers! I'd be more concerned about possible arthritic issues in the long term with rock climbing. I'm dealing with early arthritis (in the right hand i m a)from lifting weights and various paddling sports. From what I understand, rock climbing is even more damaging in this respect. Proper massage and stretching will likely slow damage in addition to icing and heating. Climbing would be great for your finger strength and horrible for your nails. By "horrible for your nails" I mean you'll essentially be filling them in the process of climbing. When I was climbing competitively (this was years and years ago) I essentially never clipped my fingernails because I was climbing 4ish days a week. I rock climbed for a number of years. Working up finger strength was great for playing but I found keeping nails was a bit of a problem. I keep short nails anyways and learned to grip things (holds) differently so it wasn't all that bad. There was a big improvement in the condition of my nails when I switched from rock climbing to mountaineering...mountaineering is just slow trudging up a really high mountain, often on glaciers and snowy fields. Don't have to worry about breaking a nail most of the time but the threat of freezing your fingers off does come up once in a while... Lots of my more obsessive climbing partners were missing fingers, ear bits, nose ends and most often toes (which is great because you can buy smaller child size boots, they cost less...). OK, so I exaggerate for dramatic effect but they really were missing toes, facial bits and the odd finger tip. It's all a trade off in the pursuit of your Rocky Mountain High, I guess...nails or fingers...Hmmm, which is expendable, which do I really need...? The author of one of my sheet music compilations (can't remember the name) listed climbing as a hobby in the intro to the book. He is / was playing at very high levels.